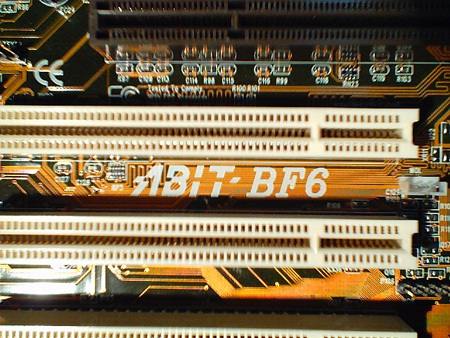 To conclude this review, I'd like to say that the Abit BF6 is definitely one of the better BX-based motherboards out there. It has proven to be quite stable and has a lot of potential for overclocking. With the right hardware and enough knowledge about overclocking, this is certainly a formidable platform to build a 440BX-based system on (or BX133 in this case). It offers excellent performance, as well as reliability. Expandability is also a boon for people planning on packing their systems with several components. Average street price for this motherboard is at Php 5,050.00 (US$ 120.00) so it isn't cheap. I can safely say that the performance DOES justify the cost though. Go get one and you'll feel that your money was well spent. I'd like to commend Abit for coming up with a good product and am looking forward to more of the same quality in the future. I give this motherboard the thumbs up. I'd also like to thank Axis Global for giving me the opportunity to try this board out. Big PROPS guys!!! PC Express: Gilmore Ave., New Manila, Q.C. PC Options: Gilmore Ave., New Manila, Q.C. Diamond Dreamchum: Unit 4 Corporate House Bldg., 239 Boni Serrano cor. Perfect Byte: 50 West Ave., Q.C. Pro Data: 129 Scout Gandia St., Q.C. NexGEN Microsystem: Unit 23 A&B Gilmore Ave. cor. Aurora Blvd., New Manila, Q.C. Send comments and suggestions here. Editor's Note: The list of stores is in no particular order.